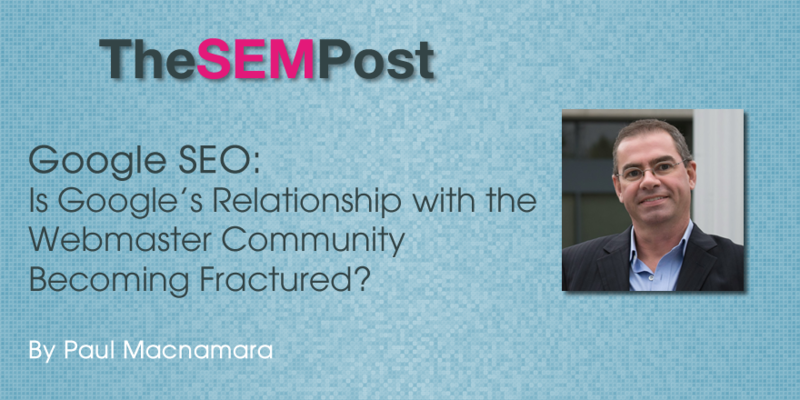 Is Google's Relationship With The Webmaster Community Becoming Fractured? You are here: Home / Google / Is Google’s Relationship With The Webmaster Community Becoming Fractured? For those who follow the SEO community, there have been many changes this year with Google’s outreach to SEOs and webmasters, starting when Matt Cutts went on leave. While one could make the argument that Google’s effort at increased communication and transparency with webmasters has been sincere, many things have been botched so magnificently over the course of the past year or so that it is at the point where its relationship with the webmaster community is as tumultuous as it has ever been. Last month, Google Capital backed service directory Thumbtack, was issued a manual penalty for unnatural links when their link building efforts were outed publicly. These type of manual actions typically require a very significant effort to get removed, and it is not at all unusual for weeks or even months to go by before a manual penalty is successfully removed. In the instance of Thumbtack, the penalty was revoked in less than a week, and the site seemed to return to historic ranking positions. Many SEO’s cried foul, making assertions that Thumbtack received special treatment from Google as a result of its relationship with Google Capital. While Google denied providing any preferential treatment, there are very few in the SEO community that believe this to be the case. That disbelief from the community is likely partly the result of a pattern of misleading and false statements from Google over the course of the past year or so that have created an air of distrust. Ever since the advent of punitive algorithmic penalties such as Penguin and Panda, Google has been consistently, and on a regular basis, making statements to the webmaster community that are just not factual, and as a result some of their credibility with the webmaster community seriously eroded. Quite frankly, it is impossible to trust at face value what Google says anymore. Most recently, we had the “quality update,” also known as Phantom 2 that rolled out at the end of April. Many of us that work in the penalty recovery space noticed massive changes in traffic to sites that shared some of the same hallmarks that had impacted Panda victims previously. Google outright denied that any type of update had taken place. Just like we don’t need a weatherman to tell us that it’s raining, we also don’t need Google to confirm an update in order to to know when an update has occurred, so by denying the obvious, Google representatives look out of the loop at best, and deliberately misleading at worst. A significant amount of the frustration is borne by misleading or false information related to both Penguin and Panda. Penguin and Panda are punitive algorithmic features in the sense that if a site that is affected, it is effectively put into a “timeout”, even if the site in question cleans up the issues that led to the penalty in the first place. Speaking about Penguin specifically, Google, through it’s representatives, have said that if you clean up the issues affecting a site, then the algorithm will no longer affect your site. We know that in many instances this is not the case. Those of us working in the recovery space all have examples of sites that have done very extensive, thorough cleanup, earned new links and have seen no improvement whatsoever in YEARS. The problem here is that these are real people with real lives, real employees and real families. Google said that yes, even though you have been impacted by this algorithmic feature, you can recover. Many business owners took that to heart and did everything they could based on that advice in order to recover their livelihoods. Some of these businesses have failed as a result. Google had not updated Penguin since October of 2013 and thousands of sites were hoping to be finally let out of jail when Google released Penguin 3.0 on October 17th of 2014. Despite this being one of the most anticipated updates in the history of the engine, Google stumbled around in it’s communications with webmasters leading to massive confusion in the webmaster community. “This refresh helps sites that have already cleaned up the webspam signals discovered in the previous Penguin iteration”. That is a laughable statement. Yes, there were some recoveries, but they were few and far between. Then, in December, they said that Penguin 3.0 was still rolling out and that it was going real time. How Google could botch communication so spectacularly during the most anticipated update in its history is remarkable. Penguin is a crushing punitive algorithmic feature that has destroyed thousands of businesses, partly as a result of these businesses believing that there was a way to fix the problem. To do all of the work and then wait patiently for Penguin to update, only to see Google treat them as an afterthought dismayed many. Panda is the next biggest gong show. At one point, it was believed that Google was running this page quality based algorithm on a near monthly basis with regular “tremors” happening in between. Sites that were impacted could clean up quality issues, and if they were thorough enough, they had a reasonable expectation of a quick recovery. All of that stopped in October of 2014, and although Phantom2 looked like it might be Panda based, we have not seen a Panda refresh since then. Again, Google have been giving misleading and conflicting statements about Panda leading to confusion and frustration from businesses that are suffering, even though they have committed resources to improving their sites. In March of 2015, Gary Illyes said that Panda was running in real-time. This was a jaw-dropping statement because those of us that watch Panda closely knew that this was not true. Businesses that had cleaned up and saw no improvement were understandably upset because if Panda was running in real time, why had they not recovered? The messaging caused total confusion. While Google eventually did come clean and admit that Panda was not running in real-time, the damage was done. The Panda messaging mess has continued with Gary Illyes saying on June 2nd at SMX Advanced that Panda would refresh between “two to four weeks.” That statement was met with a collective eye roll from the SEO community and was anyone even slightly surprised when that timeline came and went with no Panda refresh? From the flippant remarks on things such as click data not affecting scoring to the HTTPS push for what seems like a nonexistent ranking benefit, Google’s consistent misleading statements are becoming a joke for some. Would They Be Better off Saying Nothing? It seems as though messaging has become fractured and inconsistent since Matt Cutts took leave. As A.J Kohn so eloquently said in his recent post, both John Mueller and Gary Illyes are excellent ambassadors for Google, but it is highly unlikely that they had the type of pull internally that Matt Cutts had. You can make the argument that this attempt at “being more open” with webmasters is doing more harm than good and that until such time as they come up with a coherent messaging strategy, they should rethink their approach. Some of the best advice I received when I first entered this industry was that sometimes it is best to just say nothing. Would Google be well served by doing the same? Or are the somewhat misleading comments better than silence? Nailed it! Unfortunately, all of the above is very true, don’t think Google has much urgency in helping the SEO community out in general. SEO’s are all scum, right? Why do the SEO’s who need to clean up links (~90% of the time) not the creators of them? If you liked SEO’s the good guy wouldn’t have to clean up after the bad guy. Why is there a manual penalty and a hidden algo penalty? If you liked SEO’s you would tell us where our issues exist at all times. If an SEO doesn’t look for penalties or external garbage before a project, he’s likely to give SEO’s a bad name and take money without delivering results. Google knows all of the above, but they don’t care. Thank you for writing this thoughtful post. SEO professionals are holding the folks at Google accountable for what they say and write. Being under a proverbial microscope is difficult for anyone. Matt Cutts, I think, was a good representative between the two. I think Matt was under a “microscope” as well, and I think his intentions was and are genuine. I don’t support all SEOs in their attacks on Google, as some have misinterpreted and exploited what Google claims to want. Honestly, if both sides would be sincere and genuine, maybe this rift would not be so bad. My 2 cents. Nice post! Thanx for a great article discussing the mistrust issues between Google and the SEO community. The issues are an awful lot bigger than you say here, with the Black Hat SEO community causing most of the problems. If folks were not trying all kinds of starnge and malicious tricks to game the system we would be an awful lot better off. I think many of these statements by Google are just put out to throw the black hat guys a bone…..
but thius bone has no soup meat on it, so the other folks who are trying to be honest and do whats right get all frustrated and ever so upset about the deliberate bad information…. I believe this article hits to the truth of Google process of communication and flow of work. Google being a giant doesn’t seems working on schedules, doesn’t seem working for the customers really because all this webmaster communication is not helping, instead harming the site owners because we people are investing time to catch all what they say and finally end up in nothing. Check for some apps and games, you will see first rank result page filled with GooglePlay results (mobile results). Check for local results, it seems they are giving credit to their partners. Google was once really an organic place but now I feel hard to say that for Google. Google’s relationship with the community fractured a long, long, time ago.